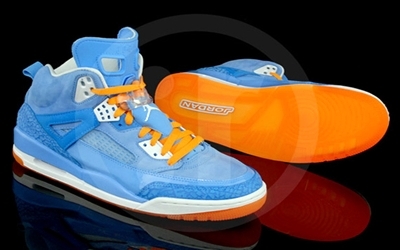 Air Jordan Spizike should be excited since it looks like Jordan Brand will be releasing several colorways of the shoe this year, like the one nice-looking edition that has already surfaced. Spike Lee’s signature shoe with Jordan Brand is expected to come out in “University Blue” colorway, which at first look looks to be a New York Knicks inspired colorway but it is not. This Carolina-inspired shoe features a university blue nubuck upper enhanced with orange accents on the outsole and laces. Impressed? Watch out for it this month or early next month! We will keep you updated! Air Jordan 1 Phat Set to Make Noise Once Again! Jordan Flight TR ’97 Set to Make Noise Again! Jordan BCT Mid Set to Make Noise Again! Air Jordan 4 Set to Make Noise Once Again! ©2007-2016 Jordan 23 Shoe Review All data and information provided on this site is for informational purposes only.